This is such a simple way to dress your Sunday School bulletin board up. Just cover the bulletin board in pink paper or fabric. Then add some black yarn in the middle by stapling it on. This will be your spider web. Buy some plastic or rubber insects like a grasshopper, fly, spider, butterfly and stick them to your board right on top of the web. Cut strips of construction paper out and write one word on each paper like- Stealing, Cheating, Lying, Alcohol, Fighting, etc. Discuss the Bible Memory Verse from Psalms 141:4 and talk about ways the children can keep from being drawn to what is evil. 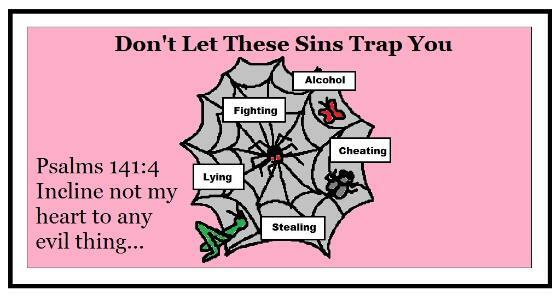 Be sure to add your words in black letters, "Don't Let These Sins Trap You" at the top of the board. Optional: You could add the Psalms141:4 scripture to the board if you have enough room and letters. Chenille-Wire Spider: Use an egg cup from an egg carton and color it black with a marker. Add two tiny red circles for eyes and punch eight holes around the rim of the egg cup. Cut two 12-inch chenille wire stems into 3-inch pieces. Insert one 3-inch pieces of chenille wire through each of the eight holes in the egg cup and twist together to make the spider's leg. Twist the feet around the spider web on the board. Cut one piece of crepe paper 5 1/2 inches wide by 7 3/4 inches long. Crimp the center of the paper to form the wings of the butterfly. Fold a 12 inch chenille wire stem in half. Twist the chenille wire together around the crepe paper to form the body of the butterfly. The butterfly's body should be about 1 inch long. Shape the ends of the of chenille wire into a V shaped antennae. Bend the tops of the chenille wire into spirals. Add some small round stickers to represent wing markings. Paint a clothespin green or use one that is already colored green and add some goggle eyes. Take 1 green chenille wire (Pipe Cleaner) and fold it in half and then stick in the clothespin for legs.